The MicroVue CIC-Raji Cell Replacement EIA measures C3d-bound CIC present in human plasma or serum. Formation of immune complexes is a protective and usually benign process of a normally functioning immune system. CIC are removed from circulation by a number of complex biochemical, enzymatic and cellular processes. Key to all of these, however, is the complement system. In certain disease states, immune complexes may initiate complement-mediated damage of various organs and tissues. This activation of complement may begin a series of potentially destructive events including cell lysis, the production of anaphylatoxins, leukocyte stimulation and activation of macrophages. Major tissue damage can also occur when IC fix to cell membranes as in some cases of glomerulonephritis. 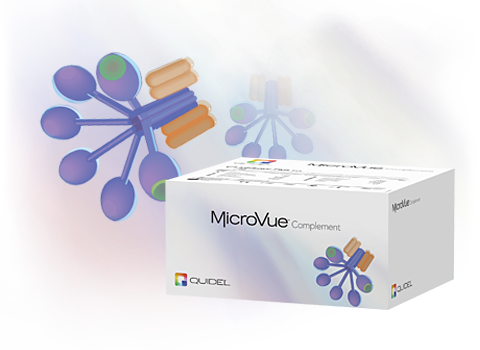 The MicroVue CIC-Raji Cell Replacement EIA uses a proprietary monoclonal antibody to a common neoantigen expressed on C3d, iC3b, and C3d, g to capture C3d containing immune complexes in human serum or plasma. In the first stage, CIC in the diluted patient samples and HAGG in the controls and standards are dispensed into the coated assay wells. After incubation, unbound material is removed in a washing step and a ready to use conjugate is added. After a 30-minute incubation, unbound conjugate is washed away. After addition of a substrate and a short incubation interval, the quantity of CIC in the sample (µg Eq/mL) can be determined by comparison to a standard curve.